For as long as there have been economic differences between people there has been some level of jealousy and envy of wealthy people by the less wealthy. At times unscrupulous politicians and others who appeal to people's emotions and prejudices work very hard to ramp up the level of discontent among those of lesser wealth. 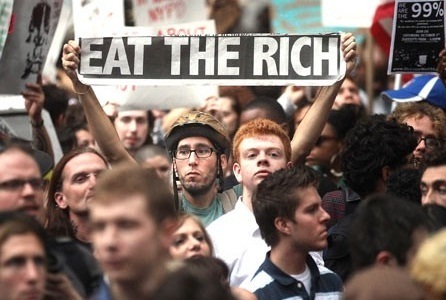 The current campaign against the rich, which began in 2009 with the swearing in of Barack Obama, is the most determined effort in a long, long time. Mr. Obama has succeeded at few things in his ignominious three years in office, but he is perhaps the greatest of our presidents in his ability to stir up bitterness among those who believe they are victims of the wealthy, as well as in persuading those who don’t realize it that they also are victims of the rich. Perhaps he subscribes to George Bernard Shaw’s insightful observation that the guy that robs Peter to pay Paul can always count on the support of Paul, Peter representing the wealthy targets of Mr. Obama’s class-envy obsession, and Paul representing those who receive continually increasing amounts of bounty from their government, courtesy of the top 10 percent of earners who pay 70 percent of the cost of our overweight and extravagant government. The president’s strategy makes sense: If your policies have only made a bad situation worse, and what it takes to make things better is in conflict with your ideological programming, you have to distract attention with a bogeyman, and get people all fired up against the bogeyman so they won’t notice how badly you are doing. Let’s examine some well known bogeymen from history: The robber barons. The term engenders visions of mean, evil, wicked, bad, and nasty businessmen amassing personal fortunes through the persecution and bullying of the common people through unscrupulous practices and even illegal schemes. The term carries such strong images that when it is heard or read, revulsion is automatic and immediate. Questioning the conventional wisdom that the robber barons were really the scum of the Earth is nearly as bad an idea as questioning that those who oppose Barack Obama policies are racists. That’s just the way it is, and if you know what’s good for you, you won’t question it. And so, such villains as John D. Rockefeller, Cornelius Vanderbilt, John Jacob Aster, J.P. Morgan, Grenville Dodge, and James J. Hill became some of the most vilified men in American history. Accounts portray these vicious, exploitative capitalist predators as victimizing their customers through thinly veiled acts of larceny for their personal benefit. However, in the continuing effort to push back the boundaries of ignorance, we bravely enter the world of the robber baron to see just whether they were as dreadful as we’ve been told all these years. And, predictably, someone dares to offer an alternative view of these contemptible characters. “Time: that is the key,” Matt Ridley, explains in The Rational Optimist. “The true measure of something’s worth is the hours it takes to acquire it. If you can get something made efficiently by others, then you can afford more of it. This is what prosperity is: the increase in the amount of goods or services you can earn with the same amount of work. The robber barons of the late 19th century usually got rich by making things cheaper” for others, he wrote. Consider Cornelius Vanderbilt, the first man referred to as a “robber baron” by the New York Times. His railroad building activities resulted in the reduction of rail fares; rail freight charges fell by 90 percent between 1870 and 1900. Likewise, Andrew Carnegie, in the process of enriching himself enormously, reduced the price of steel rail by 75 percent, and John D. Rockefeller cut it by 80 percent. In fact, Mr. Ridley tells us that during those 30 years the per capita GDP of Americans rose by 66 percent. “They were ‘enricher-barons,’ too,” he proclaims. If because of Cornelius Vanderbilt folks can get where they want to go quicker, and if that also makes it possible for them to work fewer hours to earn the ticket price, he has made a good living for himself while at the same time enriching virtually everyone else. While not technically a robber baron, Henry Ford certainly became wealthy at the expense of his customers. His first Model T cost $825, but through his efforts four years later it cost only $575, and only $360 a few years after that. While Henry was getting rich, he was making it easier for others to afford an automobile. People acting in their own self-interest not only make things better for themselves, but for the rest of us, as well. This is a basic tenet of economics, and we really need to pay more attention to such wisdom, and leave counter-productive envy behind. A strong message that comes from Mr. Ridley’s assessment of the robber barons is that the very wealthy almost always engage in activities that benefit everyone as they gain wealth. Wonder why this message isn’t more widely circulated? Maybe it’s because envy-mongering gets better results.